Ryhope CW suffered their third successive defeat last night to Shildon AFC 2-0. Shildon took the lead after the home team had initially cleared the danger from the corner, but through the man on loan from Morpeth Town Keith Graydon. Shildon superbly scored from outside of the box into the top right-hand corner of the goal leaving the keeper, Jonny Ball, no chance. Ryhope then had chances to equalise before half time and continued with similar momentum in the second half however were unable to convert their chances in the second half. In the 91st minute Shildon secured the victory through second half substitute Billy Greulich-Smith. The Striker picked up the ball midway into the oppositions half and after initially having his shot blocked by defender Danni Lay on the edge of the box, he was able to pick up the loose ball and convert the shot past the keeper. On a gloomy night at Recreation Park both sets of fans were looking forward to what promised to be an end to end encounter. In the early minutes of the game both teams were trying to get the first goal however it was Shildon who were able to get the breakthrough after their corner was cleared by a Ryhope defender only to be well struck into the home team’s net. Ryhope began to grow back into the game as Micky Rae almost latched onto a ball from Corey Nicholson on the right, however Shawn Newbrook was able to get an important hand on the ball to push the ball away from danger. As the first half progressed, so did Colliery Welfare as they came closer and closer to an equaliser. The first chance fell at the feet of former Shildon striker Micky Rae who latched onto the defender’s poor back pass however he was unable to beat the keeper. The ball then fell to James Ellis who after getting the ball out of his feet was unable to beat the goalkeeper at his left-hand side. As the half drew to a close, late change to the team, Joey Melvin almost found the net after a great weaving run through the Shildon defence, however he saw his effort saved by Newbrook. Early in the second half Nicholson received a yellow card following what the referee deemed to be a late foul on the Shildon player. In the 62nd minute Shildon brought on Billy Greulich-Smith who provided the away team with a target man, this change nearly provided an instant impact after he hit the side netting with a powerful strike. Going into the last twenty minutes of the game Ryhope were really upping the tempo and trying to force a way through. 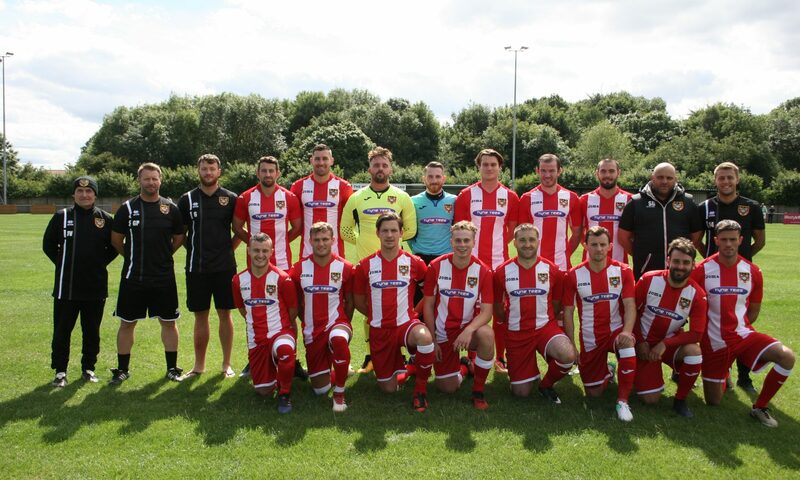 The introduction of midfielder Lee Chapman looked to bring more creativity into the Ryhope attack however the home team were unable to beat the Shildon goalkeeper. Centre backs Danni Lay and Ben Riding both had chances to convert through set pieces in the final few minutes of regular time however Riding’s header whistled over the crossbar and Danni Lay headed wide of the mark. As Ryhope had to commit men forward in pursuit of an equaliser it left them vulnerable at the back and this became apparent when in added time Jack Blackford ran up the pitch and was able to find Greulich-Smith who the ball fortunately broke for after his original shot was blocked, he then broke into the box to calmly confirm his sides victory. In what appeared to be a night of missed opportunities the home team’s manager Gary Pearson may be able to take some encouragement from the way in which his team fought until the end and their chance creation however on the night Shildon were the team who took their chances. Ryhope Colliery Welfare now head into a trio of away games hoping to register more points in the Northern League.